This amazing Toblerone Cake was made with a sponge cake and the filling and decorations are are made with cream cheese and rich Toblerone frosting. Today is my eldest son’s birthday. He came from Cyprus two days ago, where he is working, and will stay with us for a month. Happy Birthday George! We love you and miss you so much! Before coming to Athens he made a stop in Crete to visit some friends of his, where he sent me this beautiful picture of Chania. The cake is similar to the last one I made but the rich filling is with cream cheese and whipped cream and the decorations are are made with rich Toblerone cream cheese frosting, cherry preserve and three kinds of toblerone chocolate.. Most of my cooking utensils are in Assini, so I had to make the cake with a hand mixer. I don’t have all the cooking utensils I need here in Athens. For example I didn’t have a piping bag and nozzles to decorate the cake, so I improvised and used a fork to decorate the cake. 500 ml heavy cream, whipped with 1 tsp icing sugar and a few drops of vanilla essence. Prepare the sponge cake from the previous day. Prepare chocolate ganache and set aside to cool. Drain the cherries and use about 1/4 cup cherry syrup diluted with 2 tbsp cherry liqueur. Cut the sponge in the middle and wet it with the syrup. Whip the heavy cream with icing sugar and a few drops of vanilla essence and refrigerate until ready to use. See more details here. In another bowl whisk the cream cheese with 1/2 of the whipped cream and refrigerate. When the white chocolate has cooled, mix in half of the white chocolate. Use this cream as the filling and top with some of the cherry preserve. Cover the filling with the second piece of sponge and wet it again with some of the syrup. In the remaining whipped cream, add half of the remaining white chocolate and mix. Top the cake and the sides. Use the remaining chocolate ganache to decorate the cake on top. 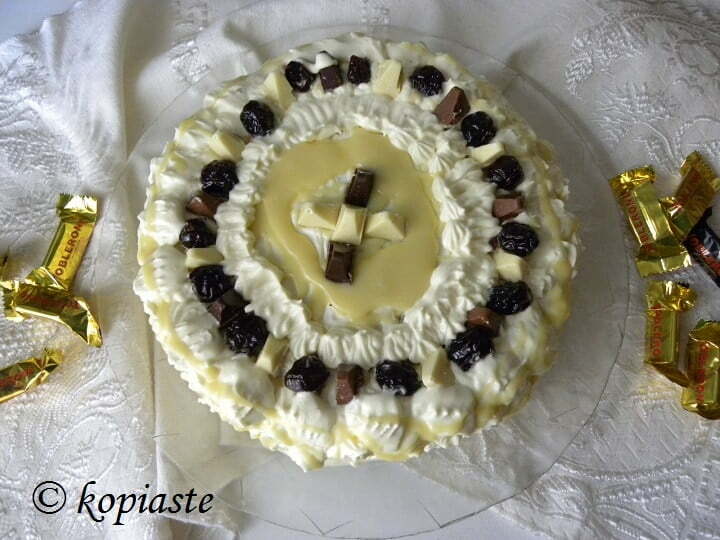 Decorate with the remaining cherry preserve and toblerone chocolate cut into 3 pieces each. Refrigerate for a couple of hours before serving it. Lots of cream and chocolate…the cake sounds and looks divine! Good Evening Ivy, My word, your toblerone cake looks absolutely fabulous and considering you did not have any of your piping tools, you decorated the cake beautifully. I have to tell you, I do love a cake…. and I will certainly be added this one to my list of cakes to make. Have a wonderful time with your son. I was looking for a birthday cake recipe for my husband, and I just hit the jackpot with your cake, he loves white chocolate! Thank you for sharing!